These pictures are of embarrassing quality, but they are a good reflection of what life has become. The weekend was a super busy and productive one. Highlights included attending the "Hammers and Ales" fundraiser for the Baltimore Community Toolbank (a great project, by the way), tapas at Pazo (a long-time favorite) and a trip to Second Chance to buy an old sink for our powder room. I love the one we bought -- it's cast iron and beefy, yet small and sweet. Photos to come. Also of note is the sheer amount of grunt work we accomplished over the weekend. I spent an inordinate amount of time (an entire Johnnie nap) scraping and cleaning up errant spackle in the master suite. The grandparents deserve a special shout-out for letting Johnnie boss them around for awhile on Sunday while we focused on working at the house. We loaded up and donated a pickup truck's worth of old furniture/toys/dishes/tools, we disposed of about 1 million pounds of wood and drywall scraps lying around the house and FINALLY got rid of the mattress and box spring that have lived in our upstairs hallway for the past month. It's nice to have an unobscured path to the bathroom again! 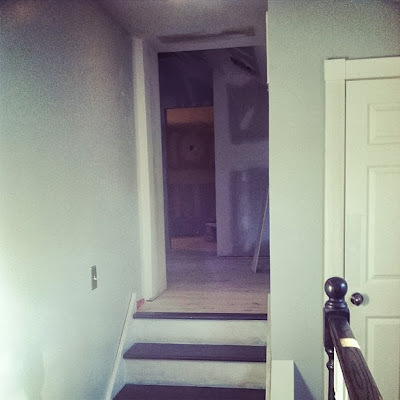 From this angle, you can see into the master suite a little bit from the hallway... Ez stood there the other day and said, "It's starting to actually look like something, isn't it?" That opening has been covered with a plastic barrier for literally years, so it's weird to look in there and see walls. We're easily pleased around here, and that's OK. This Saturday is my birthday, so... hopefully that means the birthday fairy will come and paint the walls and stain the floors. OK birthday fairy? Happy Birthday to you. Mine was on the 3rd, I turned 18. I hope all your Birthday wishes for construction come true. I've just read through your archive - WELL DONE!! Hope you had a wonderful birthday. I can't believe how much progress you've made with the house. It would be hard enough as a couple but you've had a baby as well. Being a parent is the hardest work in the world and when your child is so young, it's exhausting enough on its own. You're doing so well to combine parenthood, renovation and full time work. I had to use the anonymous profile because I don't seem to fit the other options.